My little one had her first visit to the movie theater. For this special occasion we chose this sweet and compassionate story. My Firefly followed the adventures and funny moments. The educational value is also great! She travelled through the jungles of Peru and the big city of London with the charming Paddington. 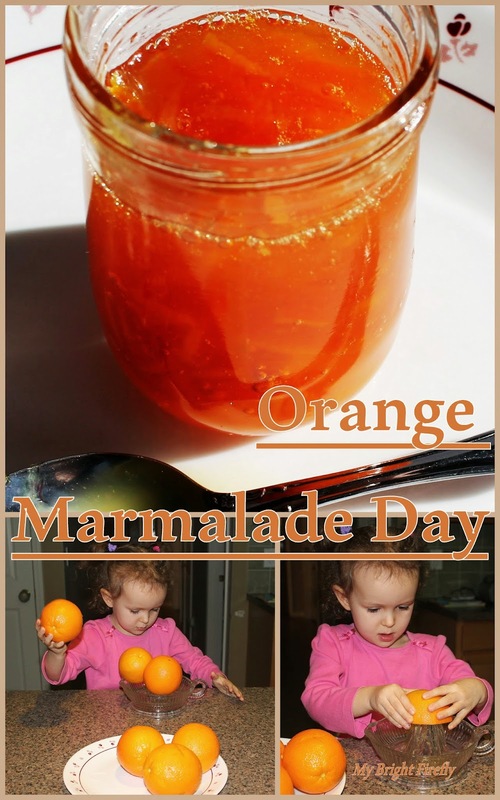 The delightful ending is my favorite: every family should have a Marmalade Day - so very sweet! This post is part of the Kids in the Kitchen series. You can find our recent "Love Cookies" here: If You Give a Mouse a Cookie. Exploring oranges and stirring the sparkly orange goop - the awesome sensory play with bright colors and cheerful smell - for my 3 year old this experience was not the actual cooking, but rather playing, learning, bonding and fun. Have a Happy Marmalade Day! Oranges are fun and healthy, but my picky eater could possibly take a bite on a better day. I am so glad she had to make her own orange juice! She drank two cups of freshly squeezed juice - yay! Making juice is a great fine motor skills activity. We had to chat about the jungles of Peru and the color orange. Are they a fruit or a vegetable? The orange is a fruit from the citrus family. Some other citrus fruits are lemons and mandarins. Oranges came from Asia. Christopher Columbus brought orange seeds to America. Nowadays California and Florida are the main producers of oranges in USA. Oranges are the perfect source of vitamin C. Vitamins C helps protect us from getting sick. Oranges are high in antioxidants and help you stay young and healthy. Gardeners sprinkle orange peel over vegetable patch to repel slugs. The state flower of Florida is a sweetly fragrant white orange. The flowers used to make the perfumes and flower water. The orange has a belly button. It is opposite the stem end and called navel. The bigger the navel, the sweeter that fruit will be. The best way to get all the vitamin C is to eat them fresh. The freshly squeezed orange juice contains the highest amount of vitamin C. Orange jam is called marmalade. We made just a little - for fun. We used: 3-4 oranges (to allow for drinking fresh juice in a process), 1 cup water, 2 cups sugar. Wash oranges thoroughly - the peel is used in the marmalade. Cut oranges in half, squeeze juice and some pulp, and pure it in a large pan. With the knife or a vegetable peeler cut out the orange colored outer zest and cut it into fine ribbons. The remaining white pith and seeds have lots of natural pectin. Cut it into smaller cubes and bundle it into cloth. I through everything together with water and sugar on medium hit and stirred to dissolve sugar. Then placed the bag with pith in, brought to boil and simmered for 2 hours. Let it cool, pull the bag out and squeeze it really hard trying to remove as much juice as possible. Discard the pith. Bring to boil again, then simmer on low for an hour.